Question: What is the best way to help the environment and, at the same time, save money? We in the UK (and the US, Australia, Canada, Europe and many other places) live in a consumer society. We buy stuff. We are encouraged to buy stuff… not just by manufacturers, but by the governments that we elect. To make sure the UK can succeed in the global economy, we are taking action to stimulate economic growth while supporting people who work hard and want to get on in life. Even in the most abundant space, eventually you reach a limit and can’t produce any more! Well, maybe I’m being stupid here, but I think that continuous growth is simply not sustainable. As an ecologist, I know that natural systems have a ‘carrying capacity’ for any given species and ecosystem. Growth occurs until the carrying capacity is reached, then there is sometimes a bit of an overshoot, but eventually if nothing else changes, an equilibrium is reached and numbers remain steady. Since our world does not have infinite resources, then infinite growth is not possible* and any government that claims it is (in whatever context) must be lying. However, many governments continue to present continued economic growth as a panacea that will cure all our woes. And how do they wish to deliver this? By getting you and me to spend money: to buy ever bigger houses, to replace our mobile phone as soon as a more advanced model becomes available, to follow fashion, to feel we can only be happy with the biggest TV, trendiest trainers and latest computer. Of course, much of the ‘stuff’ that we buy comes from overseas (why do you think China has been experiencing unprecedented growth in recent years? ), but some of the money (especially linked to things like construction) goes to companies based in our own country… and if this increases then, hey presto! economic GROWTH and, apparently, universal happiness. But it’s simply not true. First, apart from the media telling you that we need economic growth, do you really see a great benefit for YOU? And, perhaps more importantly, do you see any great benefit for the planet and the other people living on it? We continue to use up finite resources (and they really are finite, let nobody tell you otherwise) in a drive toward this nebulous thing called growth. Of course we can do things like recycling, but a demand for more and more stuff means we have to expend energy to produce it, whether from new materials or from recycled ones; plus, if we buy from overseas we have to meet the environmental costs of transportation. The more I write about it, the more like nonsense it seems. My teaching involves setting the learners lots of activities to do. At these times I want to let them get on with it without my input, so I have small blocks of ‘spare’ time. I used to take a book along with me to read, but I did tend to get interrupted and so never really got much reading done. More recently I have started taking some knitting with me. This is an ideal way to fill time, and I can even chat and answer questions whilst doing it. I lug lots of teaching stuff around with me, so don’t really want to be carrying chunky pieces of knitting, so I usually take a sock. 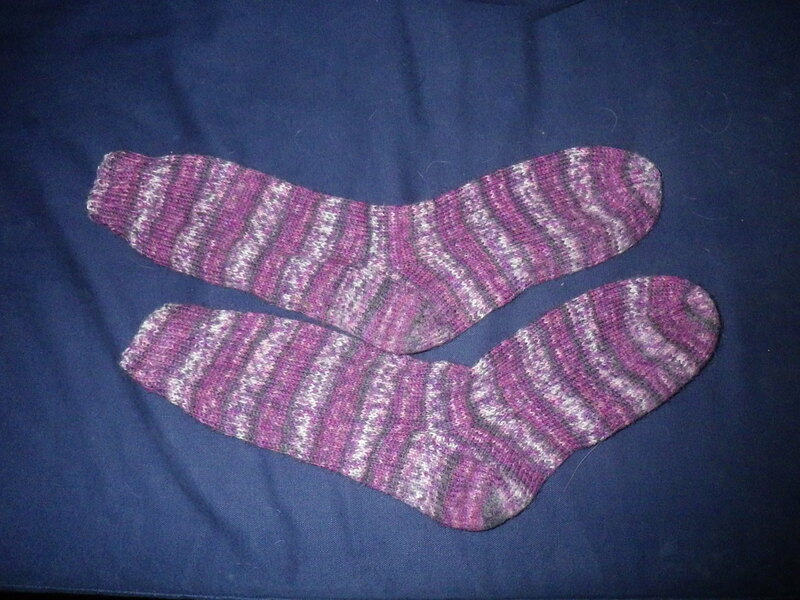 why do you knit socks when they are so cheap secondhand? you can buy secondhand socks? And the answer was “yes you can,” apparently very cheaply from car boot sales. As an infrequent visitor to car boot sales, I have little idea about what one can buy at them, but the few times I have visited such an event my perception (at least here in west Wales) is that the stalls are dominated by books, old videos, bric-a-brac and plants. My friend Anja obtained all the crockery and cutlery for her wedding reception from car boot sales, but I have never thought of them for clothes shopping. 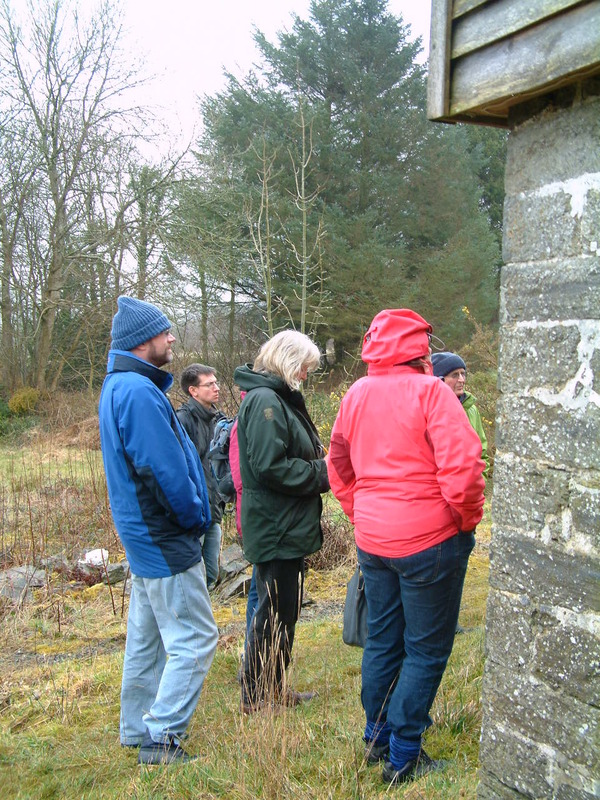 The group discussed the subject and, it turned out, that in the local area (which is very rural) no one had encountered a significant market in secondhand socks, but if you visit the big car boot sales around major cities in the UK, they are full of very cheap, hardly worn clothes, including socks. Perhaps this reflects the relative affluence of cities compared to the countryside; perhaps it reflects attitudes. Are country-dwellers less likely to consider their purchases disposable, or simply too poor to just discard clothes when they no longer appeal? I suppose that I shouldn’t be surprised that clothes are not always bought to last – the prevalence of retailers on the high street selling cheap items, often produced in sweatshops should be an indicator that these are disposable goods. If you have to save up for an item, you are surely more likely to value it than something that you buy on a whim for just a few pounds. In addition, the perception is that it’s ok to get bored with a cheap item, because you can throw it away and get a new version. I suppose, however, that the fact that clothes are being sold on is a good sign to some extent… if even socks can find a second home, then there must be hope for all sorts of other items. But wouldn’t it be better if we valued the items that we do own. Considering that 20% of the world’s population use 80% of the world’s resources, perhaps a small step to redressing this balance would be to cut back on using any more stuff. And, in fact, knitting socks may lead me to do this. First, most sock wool is guaranteed for 10 years – so the product that I am making should last me a good deal longer than most socks that I could go and buy from the shops. 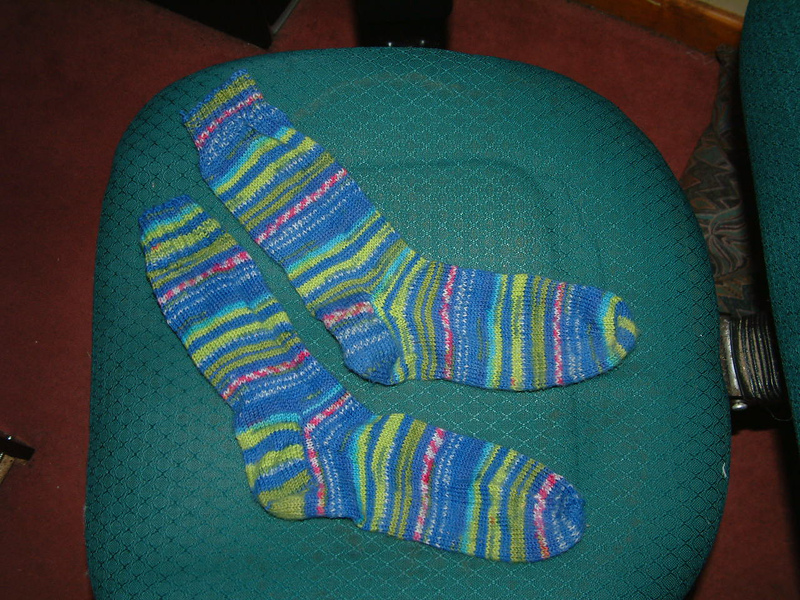 But second, because I will have spent time in the act of creating these socks and because they are unique, I think that I will value them more – perhaps taking time to mend them should they become damaged, rather than simply discarding them. We often hear the phrase “reduce, reuse, recycle”, and buying second hand delivers the second of these, but if we could all do a bit more of the first we could make an enormous difference. If only this was all she did with the mail! 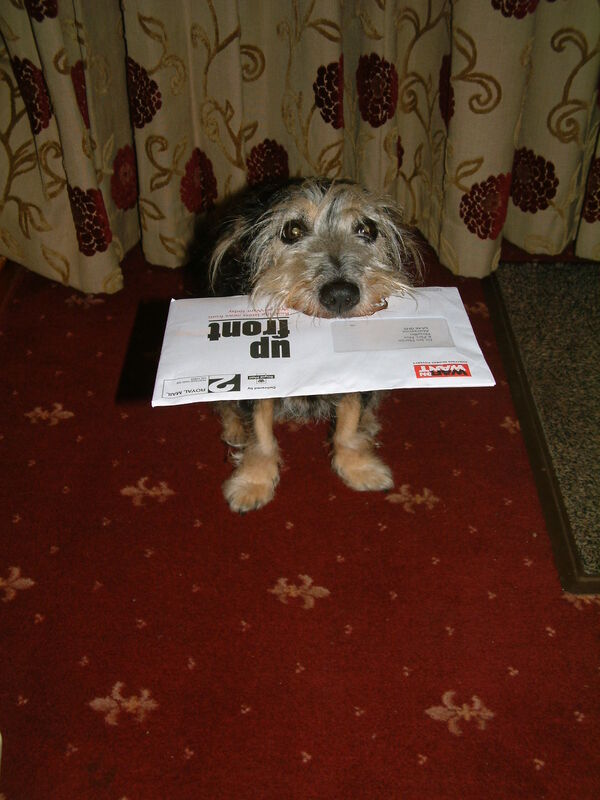 If you don’t have terriers, you may not be aware of their propensity to eat the mail as if comes through the front door (yes, we have letter slots in our doors here in the UK, not those box things on posts that seem to be the norm in the US). Maxwell does not participate in this activity, but Samantha makes up for his lack by being particularly exuberant. This means that if the curtain is open, the mail is grabbed and shredded if no one is around, or simply grabbed if someone it there to yell at her. If, however, the curtain is closed, she grabs the mail through the fabric. This means that the weight of a fairly hefty terrier is taken by the curtain on a regular basis. The result being that the curtain fabric had become progressively detached from the rufflette tape (that’s the stuff that you draw up to make gathers at the top of a curtain). The curtain is made from a very heavy fabric, selected for its insulating properties and its ability to take the weight of a dog. The thread used to stitch the components together, however, turned out to be less robust. I bought the curtain from a company who sell fabric made only from natural fibres, so it was a surprise to discover that it had been stitched together using nylon thread. The problem with nylon is that it’s slippy, so once it starts to come apart it tends not to stop. But, with my trusty sewing machine (a 16th birthday present, so it’s lasted well) I was able to reattach the tape and lining to the curtain. Each seam now has three rows of stitches, so I think that it should stay in one piece for some time. A skill like sewing is, in my opinion, greatly undervalued. Too often these days sewing seems to be considered either too old-fashioned to bother with or to be a frivolous hobby… fit only for creating fancy items. I was taught to sew by my mother, my grandmother and an old family friend, but we also had classes at school. These days, media studies and computing seem to be deemed more useful… shame. Wouldn’t it be great if all our kids grew up learning how to create and mend real, not just virtual, things? I learnt to make clothes as well as to do embroidery, needlepoint, darning… you name it. The ability to repair an item like a curtain provides a way to save money, but is also a valuable addition to our sustainability toolbox… in the same way that Mr Snail-of-happiness can repair electrical items such as my radio. You will often hear exponents of things green talk about the three Rs: reduce, reuse and recycle, but I think that we should add a fourth: repair. 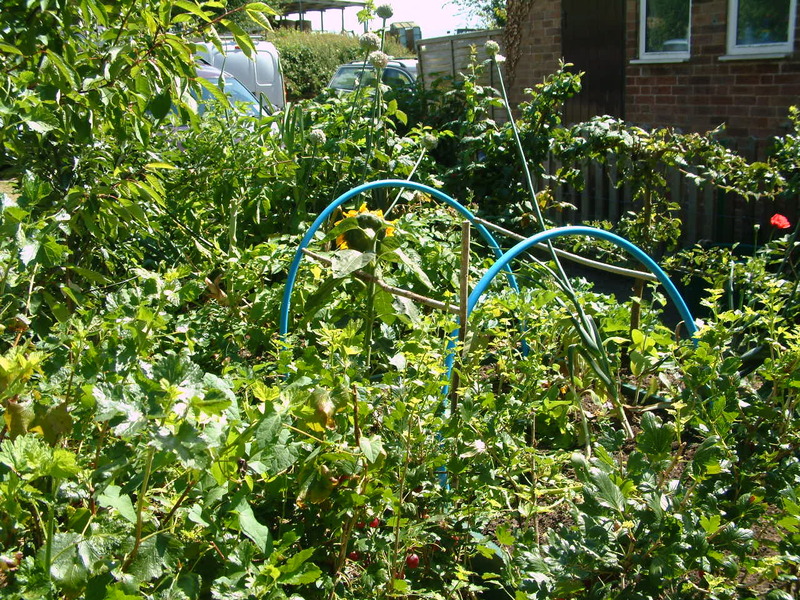 And, in our house at least, this is what we are trying to do… sewing the seams of sustainability, perhaps!